Roland's next-generation VersaUV LEF2-200 benchtop flatbed UV printer makes printing graphics directly onto a vast array of substrates and 3D objects easier and more efficient than ever. 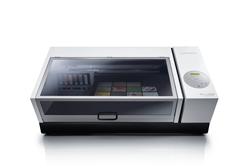 Roland DGA Corporation, a leading provider of wide-format inkjet printers. 3D milling machines, rotary engravers, and other advanced digital devices, has announced the launch of the VersaUV® LEF2-200 20” benchtop UV flatbed printer. Building upon the impressive capabilities of Roland’s previous VersaUV benchtop flatbeds, the next-generation LEF2-200 incorporates innovative new features that increase ease of use and efficiency.